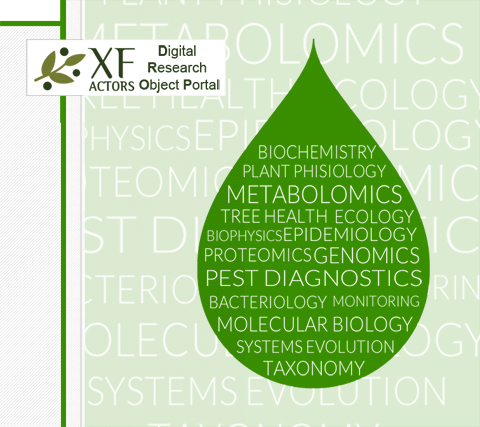 The XF-ACTORS Digital Research Object Portal (DROP) is an infrastructure that aims to provide a unique entry point to search for open research data and open access documents on Xylella fastidiosa. The acronym DROP stands for Digital Research Object Portal. DROP is an infrastructure that references digital objects (i.e. 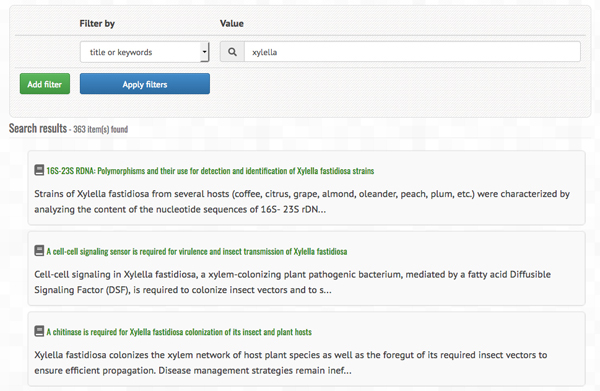 research data and documents) on Xylella fastidiosa. The Portal works as a node, a unique entry point for users to retrieve digital objects stored in various infrastructures worldwide. Each digital object is described by a set of internationally agreed metadata (the data of data) that not only summarises basic information on the data, but also provides the vocabulary that eases the categorisation and search of the data. Why such an infrastructure is needed? Governmental funding agencies (including the European Commission) require that publicly-funded research is accessible (open access) and transparent (open data) to every citizen. The amount of (research) data that is made open is increasing and with it the number of specialised or multi-purpose databases to store the data and make it accessible for use and re-use. The higher the number of infrastructures, the more difficult is to track all data made open. To our knowledge, DROP is the first attempt to address the problem by easing the retrieval of open access documents (such as scientific articles, protocols, guidelines and international Standards) and research data in plant health. The task is gigantic, reason why we have decided to tackle the problem by developing a pilot on a very important plant pest, Xylella fastidiosa. How can my data be referenced? DROP has been developed in the framework of the EU-funded project XF-ACTORS and it contributes to the legacy of the project, by making research data and documents produced by XF-ACTORS partners visible and easily accessible even after the end of the project. We are happy to collaborate with scientists (outside XF-ACTORS) that are interested to have their research products referenced in the Portal. Opening data and making data re-usable improves the visibility of the scientist’s work and increases the number of citations. For any enquiry, please contact us at bg@eppo.int. The next months will be spent to support scientists involved in the XF-ACTORS project to make their data open and feed the Portal with data/metadata. If successful, the Portal will be maintained after the end of the project by the Euphresco network for phytosanitary research coordination and funding and its scope will gradually expand to cover all regulated and emerging pests.